Combination tees serve multiple purposes. They can be used between any and all sets of tees. It is a way for a golf course to update the course for their players without the added expense of constructing new tee boxes. Keeping a golf course fresh and interesting for regular players doesn’t necessarily require investing in new tee boxes. The same result can be accomplished by blending tees. The idea of “Combination Tees” — using two or more sets of tees to add variety to a course’s setup — is probably the easiest way to update a course. 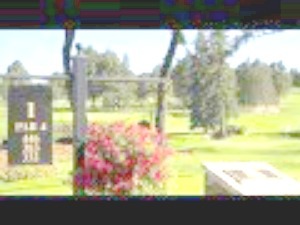 Every golfer should have the opportunity to hit par three’s in one shot, par fours in two, and par fives in three. If this is not possible, you are playing a course that is too long, and if you play a course that is too long, you will not get the joy you should from the game. By using combination tees on your course, you can make sure each hole is at the proper distance for your own distance capabilities. There’s no need for the course to purchase new tee markers. If the combo is listed on the scorecard, the player can easily see which tee they are supposed to use. Many courses have already set up these combination tees and if they haven’t, you can map out your own course. We will try to explain the use of combination tees. There are many ways to choose which combination of teeing areas to use. Some possibilities include switching tees on every other hole, using a different set of tees on short par 3’s, less difficult par 5’s, and/or longer par 4’s. Survey your players and find out what they want and how they would like to play the course, and combination tees can help you give them what they want! 1. What if there is not a set of tees that correspond with my ideal yardage? First of all, don’t expect that you will be able to match the yardage number exactly. If you are close, within 5%, that should work out fine. Also, there is nothing wrong with making up your own course. Your course me be comprised of holes using different tees. Your objective should be to play holes that always give you the possibility of hitting each green in regulation (1 for par threes, 2 for par fours, and 3 for par fives). The only downside to making up your own course is that you will not have a course rating for handicapping. 2. What if everyone else in my group is playing from different tees than me? Hold your ground. Everyone will have more fun if you play the proper tees. Nobody likes to play with a frustrated playing partner. If you are wagering, the handicap system accommodates players using different tees, so if you are playing a shorter course, you will receive fewer shots. 3. Shouldn’t the length of the course be adjusted by your handicap? NO. There are loads of examples of high handicap golfers who can hit it a ton. Are they going to like playing a real short course? The same for a low handicap golfer who is a short hitter. Will he or she enjoy hitting fairway woods into most par fours? 4. I don’t agree with your definition of an ideal course. You could disagree with this definition and create your own ideal course or adjust for a course that is not a par 72 course. 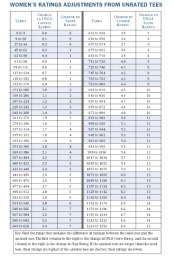 You will have to rework the numbers, but you have all the information you need to make this adjustment. 5. How well will the “driver x 28” system work for the real long hitter? At the extremes, the formula does not work primarily because there are no courses built for the extremes. For a 300 yard hitter, you need a course of 8,400 yds. You could make a good argument that golf for a 300 yard hitter is not as much fun as for the rest of us because all they are hitting is driver and short irons. It is not quite as bad as this because a 300 yard hitter will not hit his driver very often because it will go through a dog leg or simply just run out of space in the fairway to hit a driver. WHAT ABOUT YOUR INDEX AND HANDICAP? Creating a USGA or OGA Course and Slope Rating are a fairly simple update for them to generate, as they already have the information on hand. It’s a quick process that involves just a few minutes with their computer to pull up all information and make any adjustments. For simplicity they use the difference in yardages that you play to adjust the rating and slope. 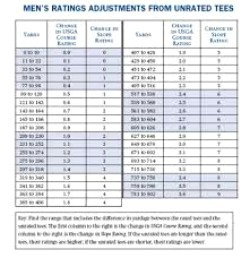 The USGA charts below give you the adjustments you need. For a better look at the charts GO TO section 5.2 OF "The USGA Handicap System." If a player decides to play a combination set of tees while they are golfing and it is not in the GHIN system, there is a way to post a score that is acceptable. The USGA Handicap System not only allows, but encourages this. The player would find out the difference in the yardage for the combined tees that they played and adjust the Course Rating/Slope up or down from the nearest set of tees. For example, using the chart above, a shorter difference of 350 yards is between 341-362 yards. Therefore, the Rating Adjustment would be reduced by 1.6. The Slope Rating would be reduced by 4. Let’s say your courses nearest set of tees has a Rating of 69.9 and a Slope of 131. The player would post his score using the Manual Option in GHIN and enter 68.9/127 as their Course/Slope rating for that round. Simple EH?? Once you have your INDEX, and you are playing a certain set of tees, perhaps at another course, you can simply find your handicap for that round. We have all gone to another course, and the locals ask you your handicap, and then make you play the tees you shouldn’t be playing. Simply ask them what is the slope of the tees you are playing, and then calculate your handicap. It’s not only FAIR, but you stand a better chance of giving them a run for their money on their own course.